Term insurance is an exclusive traditional form of life insurance plan that offers the required financial coverage to your family in hard times such as your demise. Term insurance is an effective tool that will be there to support your family to manage daily expenses and to deal with all your liabilities in your absence. It will be the safest way to secure your family after you as well. Under the same, by paying a basic premium you will get huge sum assured in returns. Apart from this, it will make the family live happily after your demise as well and allow to maintain the standard of living. Thesedays, with the growing number of insurance players and plans in the market it becomes quite difficult to choose the best term insurance plan for the secured future of family.There are many term insurance plans in India that can offer the required coverage to you. But for your ease, we have listed the top 6 term insurance plans which are highly effective and can help your family at different stages of life. Everyone is aware of LIC, it is a brand name when it comes o life insurance. The companies carry a high reputation in the marker and the most preferred choice of customers as well. LIC- e term is one it is effective term insurance policies which is full of several benefits and advantages as well. It is basically an online term insurance policy. It is a trusted brand that carries good claim settlement ratio and offers the plan at relatively very low cost. You can easily buy the same from the comfort of your home through online medium. It is a pure term insurance plan that provides death benefits and there will be no maturity benefits. It will provide coverage on all forms of death including the accidental one as well. iProtect Smart by ICICI Prudential is an effective term insurance policy that provides 360-degree coverage at a very affordable premium. It also allows you to file the claim against 34 critical illness diseases. It is also rated as one of the best term insurance plans of 2018-19 just because of its attracted features. Under the same, you will get options for selecting a payout options comprises of the lump sum, Income, and increasing income for your nominee. It also provides a terminal illness advantage. It means that you will get the claim amount in case of critical illnesses as well. It comes out with a wider cover that includes a wide list of critical illness as well. Suicidal cases are also liable to get coverage under this plan. Minimum sum assured is 8 Lakh. HDFC Click 2 Protect 3D Plus Term Plan is an exclusive term insurance policy that will be there to cover three uncertainties death, disability, and disease. It is an effective yet affordable term insurance policy. It comes out with an exclusive feature of life stage protection that allows you to increase insurance cover on certain levels without cover. It also provides the option of that allows you to increase coverage on a yearly basis. The plan is providing complete cover along with premium waiver benefit in case of critical illness. Minimum Policy tenure is 5 years and a maximum is 40 years. Max Life Online Term Insurance is the next plan in the bucket of top term insurance policies of India. It offers the required basic life cover along with the increasing monthly income options for your family in your absence. The company also carries good claim settlement ratios. Max Life online for insurance plans comes out with the option of one-time payout to the beneficiary with increasing monthly income for 10 years. t will offer the option to increase the required cover at important stages of life. The minimum tenure under this policy is of 10 years whereas the maximum one is of 35. NRI of selected countries can also take advantage of the same. SBI, the trust of many and a brand that is in the industry of banking and finance from a long time. SBI Life eShield is one of the purest term insurance policies that offer a wide range of benefits at an affordable premium. The plan provides an option of selecting a benefit from life cover and an increasing cover. Minimum tenure of the policy is of 5 years and a maximum is 30 years. Under the same, you will get coverage up to 75 Years. Aegon Religare iTerm Plan is the most affordable yet effective term insurance plan in India. The company carries good claim settlement ration which is attracting many consumers on a daily basis. Under the same, the insured can get coverage up to 100 years. It comes out with inbuilt terminal illness benefit. It offers the option to choose the payout options as well. We understand that the claim ratios of the companies is an important thing that you may wish to look for before finalizing any product. Below is the table which is depicting the claim settlement ratios of top companies. Choosing the best term insurance plan according to your needs can be a daunting task, but if you know how to crack the best deal then you can do the same easily. There are several things which are associated with term insurance plan and important to keep in mind as well. So to help you with the same we are here with the basic things that you should look for while opting the best term policy online or offline. Premium: Whenever it comes to choosing the best term insurance plan in India, people usually go for a product on the basis of premium like how much they have to pay to avail the benefits of the same. Don't forget that the premium should be low but it is advisable to not rely on the premium only check the benefits and coverage as well. This is because a plan with a low premium might offer less coverage that would not be beneficial for you. TO avail the best you must compare through our site and can see the difference on your own that which is best for you and which is not. Company's status: Well, you will agree to this factor that the market reputation of the insurance company plays a vital role in selecting the right insurance policy. You should check the claim settlement ratio of the company. It should be capable of managing all the finds and fulfills its commitment as well. Do a research or compare online to get the best one. Features: When it comes to buying a term insurance policy you should understand the plan and its features along with the coverage and exclusions in advance before taking the final call. Yes, you must look for additional features and benefits that many companies might be offering you. In such a process, don't forget that reading policy’s documents before making payments is necessary. Claim Settlement Ratio: The motive to invest in a term insurance plan is getting the needful assistance at the right time. Claim settlement ratio can help a lot in choosing the right insurance company that will be capable of offering the claim amount at the right time. It is always advisable to go for a plan that you can use for offering higher claim settlement ratio. You can easily avail this information through the IRDA portal. Attractive offers on healthcare services. By selecting the right plan, you can avail these facilities along with the basic cover. The beneficiary will be liable to receive the death benefits in case of sudden death of the insured. With an effective term insurance plan, your family can easily avail the required financial assistance in your absence and can continue to live with the pride. IN case of insured disability or critical illness, the policy will be there to assist the family. Offers lumpsum amount, if you get diagnosed with any critical illness. Why Go For The Best Term Insurance? With the growing inflation rate, it becomes quite obvious and necessary to secure the future of your loved ones that will protect them from several unwanted incidents. We all know that life is uncertain and not sure when and where we will meet our last phase of life and in such situations, all you may think of is your family’ security. If you are the sole earner of the family, then there is the possibility that you must be holding several responsibilities and liabilities as well. There must be several responsibilities waiting for you in future like your child’s education, marriage, old age parents, and several other liabilities as well. Have you ever thought that, if by any bad luck you met an accident that leads you towards death then what will happen to your family? How will they deal with this emotional and financial trauma? We all believe that nothing is going to happen, but is that true? Are we carrying different benefits or power that will protect from accidents or death? No we all know that life is uncertain and no one is sure about how long will they live. But one thing is very much clear that if you the sole earner of the family meets an accident and dies then it will become impossible for your family to live a secure and stable life. Don't you think that you should do something that will help them in the long run or after you? We all know that emotional trauma is something that no one can deals with it happily but the financial assistance during such stages will be a big relief for them. At least they don't have to manage for financial assistance with the emotional trauma. You can do the same only with the help of an effective term insurance plan. A term insurance plan will be there for your family in your absence and can easily manage with all your responsibilities whether it is about daily financial expenses, child’s education, parent’s treatment, child’s marriage, etc. Moreover, it will clear all your liabilities so that family would not feel burden off repaying them regularly. 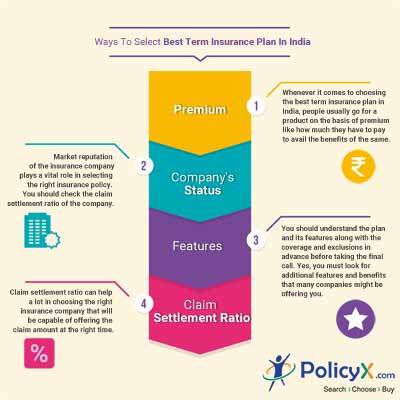 In India, there are many insurance companies that deal with term insurance plans. Sometimes, with so many options it becomes quite difficult to buy the best one according to your needs. We are here to provide ease tp you with the same. We are here for several benefits and free quotes that allows you to choose the best and affordable plan. 1. Are riders available with every term insurance plan? No. It is not necessary that you will get riders along with every term insurance plan. It can vary according to the insurer and plans as well. A few of them offer the same might offer it separately and a few may take care of the same in the plan itself. 2. Can I take more than 1 term insurance plans? Yes, you are liable to invest in more than 1 term insurance policy. 3. What I have to do to get a cover of Rs. 10 crore? In the case where you want to opt for a high sum assured, you have to talk to the insurance company and ask them about it. They carry a different process and first will rectify your details before proceeding further. 4. Can I take a term insurance plan if I am an NRI? Yes. If you are an NRI, then also you can easily invest in a term insurance plan. You can also get an exclusive plan for yourself as well. 5. How do I cancel my insurance policy? You can cancel the policy by informing the insurance company within 15 days of the policy being issued. 6.What are the documents required for buying term insurance plans? 7. Can someone avail loan on term insurance plans? No, policyholders are not eligible for loans as the policy doesn’t come with maturity benefits nor does it attain surrender value. 8. Does term insurance have a free-look period? Yes. Term insurance plan also carries a free-look period of 15 days, from the day you receive the policy document. If you cancel the policy in between this period then your amount will be refunded after minor deductions. 9. Do I have to pay penalties if my payment is late but within the grace period? The policies related to late payment fee may differ from insurer to insurer but if you ade the payment within the grace period then no interest is charged on the payment. Content Written on : 25th, Jan, 2019.